On January 1, 2012, former Department of Emergency and Cardiovascular Medicine was merged into the Department of Molecular and Clinical Medicine. The former Department of Emergency and Cardiovascular Medicine has been involved in a major international project on Cardiovascular Epidemiology, titled PURE (Prospective Urban Rural Epidemiologic study). It is a comparative prospective cohort study carried out in 15 countries – India being one of them – focusing on social determinants for health. A comparative study in Sweden is also connected to PURE. More information about the project (in Swedish only). Two PhD students were involved in the project, Kerstin Dudas and Lena Björck. In November 2007, Prof. Annika Rosengren received SEK 2 778 000 as a four-years grant (2007–10) from the Swedish research council FORMAS for the project ”PURE – a Prospective Urban Rural Epidemiologic study”. More information about the project (only in Swedish). Associate Professor Peter Eriksson is involved in research collaboration on private basis with the Rabindranath Tagore International Institute of Cardiac Science (RTIICS) in Kolkata, India. Eriksson, who is a cardiologist, studies inherited cardiac diseases together with Dr Biswajit Bandyopadhyay, Pediatric Cardiologist and Head of the Kolkata institute, and have written a joint article for publication. 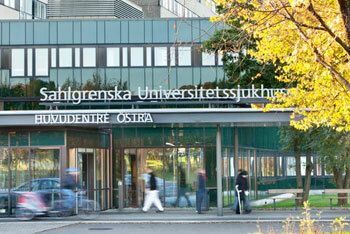 The latter visited Gothenburg in April 2012 to discuss further cooperation. RTIICS was set up in April 2000 as a Unit of Asia Heart Foundation, a trust that aims to develop a network of Hospitals throughout India, to bring world-class cardiac care facilities within the reach of the common man.